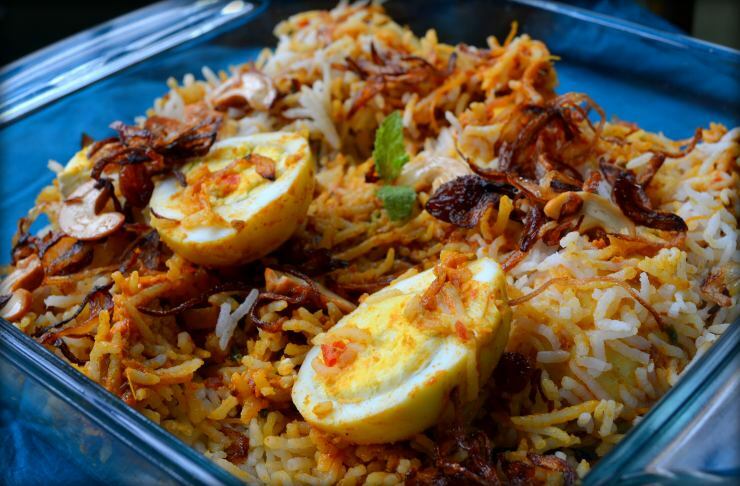 Egg biryani is a very popular variant of the Biriyani, and is relished by eggetarians. It’s easy to prepare & prepared with Basmati rice & spices and it is then cooked on dum. Hard-boil the eggs, de-shell and keep aside. Meanwhile heat 2 tsp ghee in a pan/kadhai and add the fennel seed powder along with sliced onions and green chillies and sautÃ© till soft & golden brown. Now add ginger-garlic paste and again sautÃ© for 2 minutes. Add the remaining powdered masalas (pepper, turmeric, coriander and chilli powder) and fry till the masala is well cooked. To this add chopped tomatoes, cashew paste and yoghurt and mix well. Add the eggs to it. Finally add the chopped coriander and mint leaves along with the lime juice and mix well.Check seasoning (add more salt if required). Remove from heat. For the rice soak the basmati rice for half an hour and then drain the water. In a big vessel heat the 4 tbsp ghee and 2 tbsp oil and add bay leaf, cinnamon, cloves and cardamom. To this add the basmati rice and fry till the colour of the rice changes a bit. Now add 4 cups of boiling water to it and mix well. Cook the rice on high flame till half done and then add rose water and close it with a tight lid and cook on low flame till done. While the rice is cooking in a pan heat remaining oil and ghee and fry the sliced onions till crispy brown and keep aside. In the same oil/ghee fry the cashews and keeps aside. Do the same with the raisins. Once the rice is cooked and water is fully evaporated then add the fried onions, cashews and raisins to the rice and mix well. Now to set the Biriyani in a big dish first spread one layer of rice then on top of it spread one layer of the prawn masala. again on top of the prawn spread another layer of rice and the a layer of prawn masala. Repeat the entire procedure for the remaining rice and prawn. Finally to set the biryani bake it in oven. Serve hot with curd raita, pappad, boiled egg and pickle.